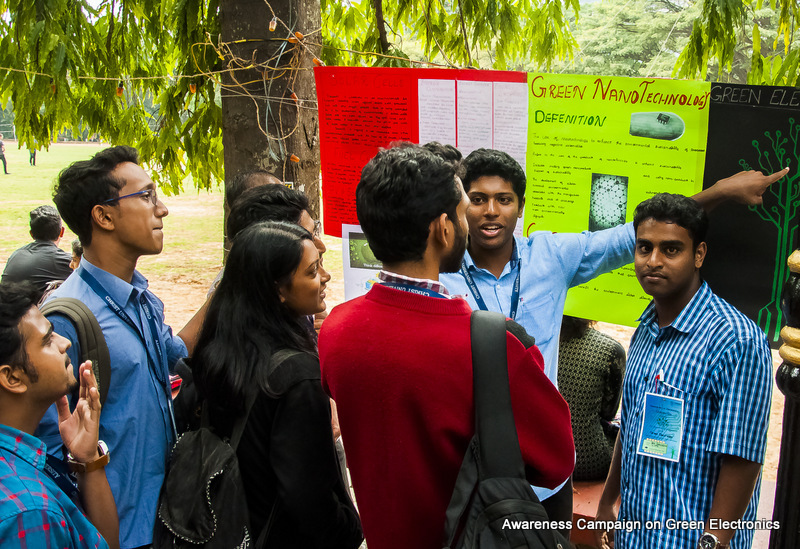 Electronics Club had organized an awareness campaign, i2R on “Green Electronics” on Friday, 16 December 2016 in the main campus, Christ University, Bengaluru. The campaign was managed by the enthusiastic students from second year B.Sc. PME and CME classes. The students explained the importance of the concept of green electronics in present situation as the market is flooded with various electronic gadgets. The campaign covered a lot of exciting topics under green electronics like, use of solar LED lantern, organic LED displays, saving electricity using LDR, battery operated vehicles, self healing materials, digitization of currency, alternate energy sources, Portable wind turbine, hydrogen fuel cell, internal body powered by flash light, e-waste management, e-cycle, eco ATM, etc. A total of about 120 students participated in the campaign and with the help of charts and a few models they explained the respective topics to the visitors in the pathway of main campus. The students from other classes, other deaneries and faculty members from other departments interacted with the student volunteers during the campaign. The faculty members from the department of Electronics were present throughout the event and provided the necessary guidance and support to the students. The Electronics Club sincerely thanks the Christ University management for providing the opportunity and encouragement to organize a campaign on socially relevant topic green electronics.